What’s the best form of cardio training when you want to reach your goals safely and quickly? There’s basically two types of cardio training; High intensity interval training (HIIT) and traditional steady state cardio. HIIT is all the rage right now but if you walk into a big box gyms you’ll see rows upon rows of “cardio” machines touting the benefits of long steady state cardio. So what’s the right one for you? Lets look at Slow Long Duration (SLD) endurance training first. It’s aptly named because you usually do it for a prolonged period of time and at a lower percentage of heart rate. It’s when you go to the gym and jog on the treadmill at 4.0 mph for 20 minutes or longer, usually longer. It has a bad (but undeserving) reputation in some training circles for the few reasons discussed below. 1. It takes a long time to do – Not everyone has hours to do cardio plus your taking a big chunk of time away from strength training. All those hours training can also be difficult to fit into a busy schedule making it less like to stick as a habit. 2. It can burn muscle – This was one reason we’re told not to train cardio so long. It’s possible when doing sustained cardio that your body will use amino acids, the building blocks of muscle, to fuel your exercise. Not an ideal situation if you’re trying to gain muscle. This however is really only a factor if you’re a physique competitor trying to greatly increase muscle mass otherwise a good strength training program will counter the effects of muscle loss. 3. Increase risk of repetitive stress injury – It’s been said that it’s not if an endurance athlete will get injured it’s when. The injury rate for runners is 75% due to the many steps repeated (2,000 per mile) under load in only one movement pattern. That’s a lot of specific stress on the muscles and joints, so much that it’s easy to develop muscle imbalances and over use injuries. It’s not all bad news though, there are some big benefits as to why SLD endurance training should be a part of your program. 1. Increases maximum cardiac output – Long endurance training gives your body something HIIT can not. An increase in maximum cardiac output or the amount of blood your heart can push at any one time. In a comparative study, the long endurance group was able to increase this by 9% where the HIIT group was not able to increase this at all. This shows that SLD cardio elicited a greater response for the strengthening of your heart and central cardio vascular system. 2. Creates the foundation – Long slow endurance is also used to create a cardiovascular base for increased performance in the future. Think of it this way, like a triangle, the greater the size of the base (foundation) the higher the peak. You’re cardio fitness works in this same manner. The larger the base you build in the beginning the greater the peak or your fitness potential. 3. A Safer method of training – SLD training is safer because you can perform it simply by walking (briskly if needed) or by using a cardio machine. Both of these modes of training are relatively safer than doing sprints, burpees, plyometrics and other high intensity exercises. You’re also less likely to have a complications with your breathing or heart at lower heart rates than at higher ones. This lends SLD as the type of cardio to begin your training or if you’re needing to work around an injury. 1. Stay with between 60-70% of your max heart (220-age) during the duration of the session. 2. Going too high with your heart rate will cause you’re body to fatigue and you won’t be able to sustain the exercise for the duration of the workout. 3. Aim for 45 minutes or longer. Adjust according to what’s appropriate for your fitness goals. 4. Ideal for walking, hiking, jogging or spending time on your favorite piece of cardio equipment. 5. Perform one to two times per week, ideal for weekend training sessions when you have more time or when you want a more enjoyable type of exercise experience. As you can see, there may be a couple drawbacks to SLD training but there is also a very big upside too. Especially when you consider how important it is to safely build your cardiovascular base and burn calories when you’re just starting out. 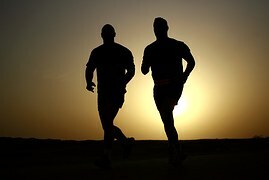 Even if you’re an experienced endurance athlete SLD will have a place in your cardio training program because you can’t run at high intensity all the time. In fact, many elite runners use this method of training the majority of their training time! In a world full of high intensity workouts and gyms, don’t neglect one of the most powerful ways for you to improve your health and fitness. If you have any specific questions in regards to cardio training please feel free to leave a comment below, I’d love to hear from you. ← How Much Protein Should I Eat?